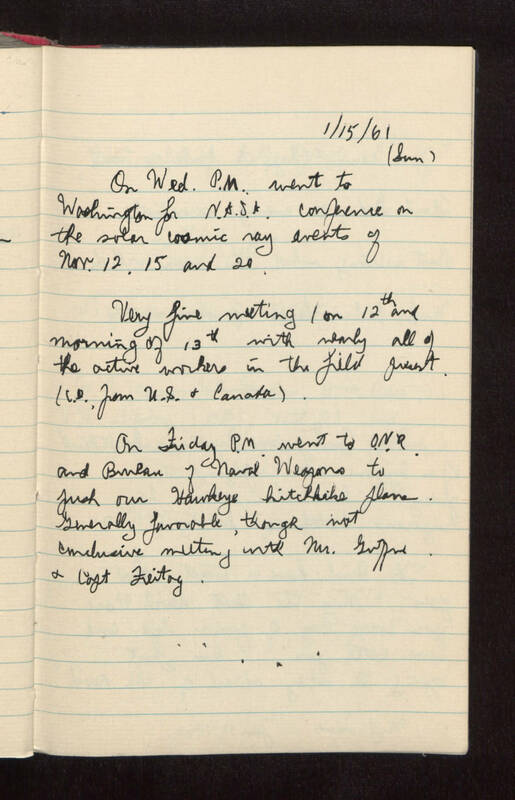 1/15/61 (Sun) On Wednesday P.M. went to Washington for N.A.S.A. conference on the solar cosmic ray events of November 12, 15 and 20. Very fine meeting [1?] on 12th and morning of 13th with nearly all of the active workers in the field present (i.e., from U.S. and Canada). On Friday P.M. went to O.N.R. and Bureau of Naval Weapons to push our Hawkeye hitchhike plans. Generally favorable, though not conclusive meeting with Mr. [Gifford?] and Captain Freitag. . . . . .